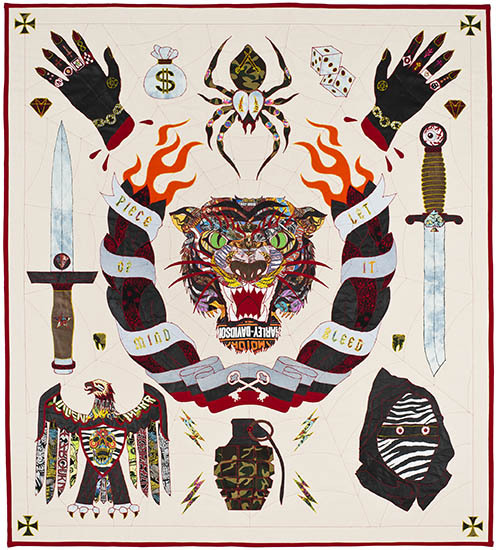 Ben Venom, “All the Aces”, hand-made quilt with recycled fabric. Image courtesy of the de Young Museum. May 6th – May 31st, Ben Venom: Thrill of It All, The Artist Studio program at the de Young Museum: Ben Venom’s residency at the de Young Museum will expand on his current body of work by completing 9′ x 11′ handmade quilts constructed in part from donated/repurposed material (i.e. band shirts, jeans, etc.). This material, donated by friends, family, and community members, will become the foundation for the quilts. By stitching used clothing into a unified piece, the quilts display a multitude of personal histories. Everyone’s unexplained stains, tears, or rips will be included and when displayed, visitors will be able to see a piece of themselves sewn into a functional quilt. The designs will draw from research in the fields of mythology, the occult, folklore, and motorcycle gang logos. Visit The Artist Studio program Wednesdays–Sundays, 1–5 pm in the de Young | Kimball Education Gallery/Artist Studio. There will be an artist reception at the end of his residency Friday, May 29th 6 – 8:30 pm. Detail of David Vera, “Sweetbook”, 2014 and installation view of SF Camerawork. Images courtesy of Benjamin Hoffman and SF Camerawork. Ongoing to May 23rd, Existe Lo Que Tiene Nombre: Contemporary Photography in Mexico at SF Camerawork: A two part exhibit organized by San Francisco-based curator Sergio De La Torre and Tijuana-based curator Javier Ramírez Limón, in conjuction with Galeria de la Raza. The title of the exhibition, Existe lo que tiene nombre, comes from a conversation with the artist Jazzibe Santos, whose photographic project documents her grandmother’s household of labeled objects. Ranging from humorous to disturbing, personal to ambiguous, Santos’ photographs, along with those of the 22 artists featured in this exhibition, are indicative of the current state of contemporary photographic practices in Mexico. SF Camerawork is located at 1011 Market Street, 2nd floor. 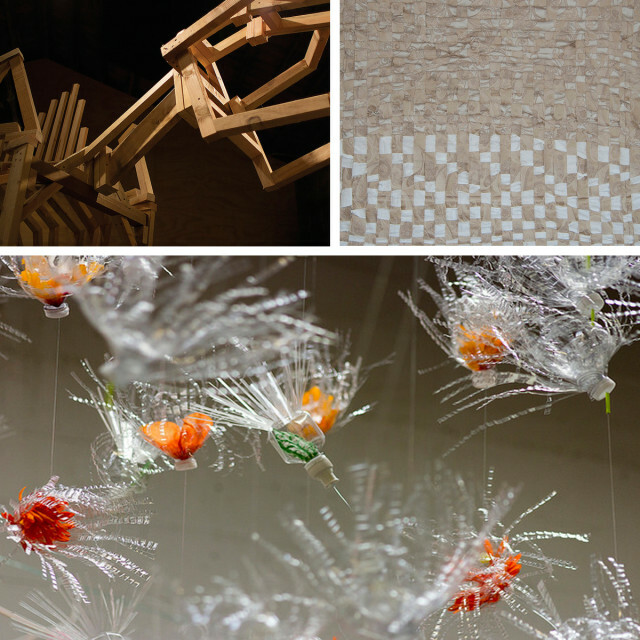 Works by Mike Arcega, Eden V. Evans and Ma Li at Recology San Francisco. Images courtesy of Recology SF. Friday May 22nd – Tuesday May 26th, Recology San Francisco Artist in Residence Exhibitions: Michael Arcega, Ma Li and Eden V. Evans: The Artist in Residence Program at Recology San Francisco is a unique art and education program that provides Bay Area artists with access to discarded materials, a stipend, and a large studio space at the Recology Solid Waste Transfer and Recycling Center. By supporting artists who work with recycled materials, Recology hopes to encourage people to conserve natural resources and promote new ways of thinking about art and the environment. During their residencies, artists have scavenging privileges and 24-hour access to the company’s well-equipped art studio. At the conclusion of their residency, Recology hosts a two-day public exhibition and reception for the artists featuring the artwork made during their residency. The current exhibit opens with viewing times on Friday, May 22, 5-9 pm and Saturday, May 23, 1-3 pm. Additional viewing hours are Tuesday, May 26, 5-7 pm with a gallery walk-through with the artists at 6:30 pm at 503 Tunnel Avenue. San Francisco Art Institute MFA student Dio Chen “Depende”, still from a film, 8 mins 51 seconds. Image courtesy of SFAI. San Francisco State University – Ongoing – May 16th, MFA Thesis Exhibition, 1600 Holloway Avenue: Emerging, prolific artists present new work in photography, sculpture, new practices, painting, conceptual and information arts and printmaking. Showcasing the creativity and diversity in the Art Department’s rigorous, competitive three-year Master of Fine Arts program, these artists all exhibit their works actively throughout Northern California and beyond. Gallery hours: Wednesdays through Saturdays, 11am to 4pm. Mills College – May 3rd – May 31st, Terra Incognita, 5000 MacArthur Blvd, Oakland: Terra Incognita features work in a wide range of media—painting, photography, sculpture, installation, video, and performance—created by the emerging artists of the Mills College MFA in Studio Art Program. Opening reception is Saturday, May 2nd 6 – 8pm. California College of the Arts – May 14th – May 23rd, 2015 MFA Thesis Show, 1111 8th Street: The CCA graduate MFA program has an interdisciplinary orientation that supports both the crossing and merging of mediums as well as the investigation and use of content from diverse areas of thought. San Francisco Art Institute – May 14th – May 17th, Edge Effect, Pier 2 Fort Mason Center: 100 artists from San Francisco Art Institute’s graduate program present eclectic visions at the leading edge of contemporary art. Installations, painting, photography, video, sculpture, printmaking, performances, and hybrid forms come together for an exclusive four-day-only exhibition. Open daily 11 am – 6pm. Opening reception is Friday, May 15th 7 – 9 pm. University of California at Berkeley – May 15th – June 14th, MFA 2015, 1275 Walnut Street, Berkeley: For the past forty-four years, BAM/PFA has teamed with the UC Berkeley Department of Art Practice to present the work of its graduating MFA students. Because of the closure of the BAM/PFA Galleries in 2015, this year’s MFA presentation will be held at the Berkeley Art Center, 1275 Walnut Street, Berkeley.